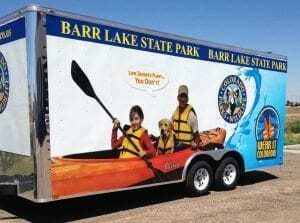 Vehicle graphics and trade shows… Why did we group them together? Because when you attend your trade show, you can get double exposure with your vehicle graphics. From travelling to and from the event, driving up the ramp at the event venue to load and unload, visibility in the parking lot for other vendors and attendees, your car or trailer acts as a mobile billboard building name recognition. We always try to get an end spot when we park at a trade show. This way we are always visible to everyone –vendors and attendees. Make that car work for you! 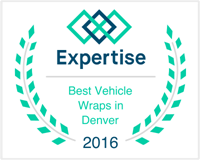 Being one of the Top Best Denver vehicle wrap companies (awarded by Expertise) we can customize a traveling campaign for any vehicle to help get you the exposure you’re looking for on and off the road. Just like a tradeshow booth, you want your vehicle to be bold and tell people what you’re all about in a quick snap shot! Make sure to utilize your power marketing combo. Now, as far as trade shows, did you know that you can ask the event venue what companies have already signed up and what floor space they are in? Always review this information and pick a company that you know will bring a lot of foot traffic. When we exhibit at the Colorado Restaurant Show, we like to be near a wine and beer vendor. We know that people will come there for the free drinks and while they are standing in line, we can chat them up. always look at who is going to be there, and where they are located and position you for the best possible visibility. Speaking of visibility, how is your trade show displays looking? Are they ready for a face lift? Do you need new ideas on ways to attract people to your booth? Give us a call or check out our website Tradeshow Section. And don’t forget to have your promotional giveaways. Check out our Promotional Item Catalog. Start your New Year off with fresh marketing ideas. Get those vehicles wrapped and your tradeshows booked. Happy selling & I look forward to seeing you in the New Year!